Simon & Schuster, 9780684848099, 768pp. From Pulitzer Prize-winning author Taylor Branch, the second part of his epic trilogy on the American Civil Rights Movement. In the second volume of his three-part history, a monumental trilogy that began with Parting the Waters, winner of the Pulitzer Prize and the National Book Critics Circle Award, Taylor Branch portrays the Civil Rights Movement at its zenith, recounting the climactic struggles as they commanded the national stage. Taylor Branch is the bestselling author of Parting the Waters: America in the King Years, 1954-63; Pillar of Fire: America in the King Years, 1963-65; At Canaan’s Edge: America in the King Years, 1965-1968; and The Clinton Tapes. He has won the Pulitzer Prize and the National Book Critics Circle Award. 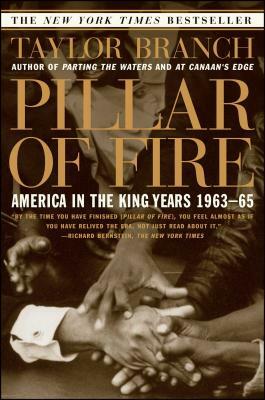 Richard Bernstein The New York Times By the time you have finished [Pillar of Fire], you feel almost as if you have relieved the era, not just read about it. James Goodman The Boston Globe This is jet-propelled history. Jeff Shesol The Washington Post Politics and personalities, ambition and imagination, triumph and tragedy. David M. Shribman The Wall Street Journal One part biography, one part history, one part elegy...a vast panorama...powerful. Jon Meacham Newsweek Pillar of Fire is a magisterial history of one of the most tumultuous periods in postwar America. Branch's storytelling is strong, his storytelling colorful. Reading Branch, it is easier to see why even the most remarkable revolutions are never complete. Alan Wolfe The New York Times Book Review As he did in Parting the Waters, Branch brings to these events both a passion for their detail and a recognition of their larger historical significance. Scott Ellsworth The Oregonian Magnificent...the birth of a masterwork akin to Carl Sandburg's Lincoln or Shelby Foote's Civil War. Bill Maxwell St. Petersburg Times Pillar of Fire, a history of symbiosis and epiphany, records King's vision and the disparate moral currents that forced America to redefine itslef in light of its failures to live up to its own principles of freedom. Trevor Coleman Detroit Free Press The strength of Pillar of Fire lies in Branch's unsurpassed ability to bring the reader into the moment, enabling one to almost feel the tension of the times.